Natalie Batalha has had plenty of experience fielding questions from both layfolk and other scientists over the past couple of years  and with good reason. Batalha is the deputy principal investigator for the spectacularly successful Kepler space telescope, which has found evidence of more than 2,000 planets orbiting distant stars so far  including, just last week, a world almost exactly the size of Earth and another the size of Venus. But Kepler is giving astronomers all sorts of new information about stars as well, and that's what a European TV correspondent wanted to know about during an interview last year. Was it true, she asked, that stars like the sun will eventually swell up and destroy their planets? It's a common question, and Batalha recited the familiar answer, one that's been in astronomy textbooks for at least half a century: Yes, it's true. Five or six billion years from now, Earth will be burnt to a cinder. This old news was apparently quite new to the European correspondent, because when she reported her terrifying scoop, she added a soupçon of conspiracy theory to it: NASA, she suggested, was trying to downplay, and maybe even suppress, the story. It was not a proud moment for science journalism, but unexpectedly, at about the same time the European correspondent was reporting her nonbulletin, Kepler scientists did discover a whole new wrinkle to the planet-eating-star scenario: it's apparently possible for planets to be swallowed up by their suns and live to tell the tale. 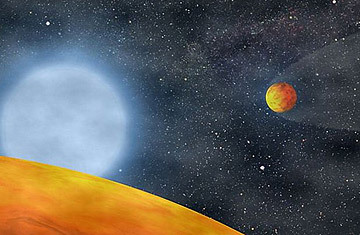 According to a paper just published in Nature, the Kepler probe has taken a closer look at a star called KOI 55 and identified it as a "B subdwarf," the red-hot corpse of a sunlike star, one that already went through its deadly expansion. Around it, whirling in orbits so tight they last only about 5 and 8 hours, respectively, are two planets, both a bit smaller than Earth  and both so close to their home star that even the tiniest solar expansion ought to have consumed them whole. And yet they seem, writes University of California, Santa Cruz, astronomer Eliza Kempton in a Nature commentary, "to be alive and well. Which begs the question, how did they survive?" How indeed? A star like the sun is powered by nuclear fusion, in which hydrogen is converted to helium and releases massive amounts of energy in the process. It takes about 10 billion years to use up the hydrogen supply, which means that the sun, which is 5 billion years old, is running on a half-empty fuel tank. Once the hydrogen is gone, the star cools from white hot to red hot and swells dramatically: in the case of our solar system, the sun's outer layers will reach all the way to Earth. Eventually, those outer layers will waft away to form what's called a planetary nebula while the core shrinks back into an object just like KOI 55. If a planet like Earth spent a billion years simmering in the outer layers of a star  a plausible time span, given what astronomers know of stellar evolution  it would, says University of Arizona astronomer Betsy Green, a co-author of the Nature paper, in a press release, "just evaporate. Only planets with masses very much larger than the Earth, like Jupiter or Saturn, could possibly survive." And yet these two worlds, known as KOI 55.01 and KOI 55.02, lived through the ordeal anyway. The key to this seeming impossibility, suggest the astronomers, is that the planets may have begun life as gas giants like Jupiter or Saturn, with rocky cores surrounded by vast, crushing atmospheres. As the star expanded, the gas giants would have spiraled inward until they dipped into the stellar surface itself. The plunge would have been enough to strip off their atmospheres, but their rocky interiors could have survived  leaving, eventually, the bleak tableau of the naked cores of two planets orbiting the naked core of an elderly star. What makes this discovery doubly surprising is that the astronomers who made it weren't looking for planets in the first place: they were trying to get a handle on the final stages of stellar evolution  specifically, on the pulsations old stars go through in their extended death throes. KOI 55 was pulsing, all right, in much the way theorists have described, and that provided the clues that led to the discovery of the star's dry-roasted offspring. Superimposed on the days-long pulsations, the astronomers discovered, were changes in brightness that came at periods of just hours. Unlike the worlds Kepler normally finds, these changes weren't found to be the result of the planets passing in front of the star and dimming some of its light. They occurred instead because the planets go through phases like the moon  fully illuminated when they're on the far side of the star, nearly dark when they're on the near side. That nifty bit of cosmic deduction was exciting for astronomers, but it offers little reassurance for those fretting about how we'll fare when our own sun bloats out to Earth-frying size. Waiting for Jupiter to spiral in and lose its atmosphere, then hopping on over, doesn't really feel like a workable solution. But  note to that European TV reporter  never fear. Given that we have 5 billion years to figure things out, it might be a little premature to panic. See "Views of the Asteroid Vesta." See photos of Earth from space.